Anything added to bacon has to make it more delicious right? Well try green beans and bacon, most awesome way to make your grean beans unhealthy. Really. First - Start with a pound of bacon. Cook until you get your desired crispness. Then add a whole lot of green beans. I took this picture just to show you that the bacon is indeed under all those green beans. I used one of those packages of green beans from Costco, I'm guessing it was about a pound or so? You know the ones I'm talking about, it's in the cold room in Costco? Right? And of course the really healthy green beans in the end. So yummy, we try to only have these once or twice a year if that...they're so good, you can't stop eating them. See how much they cook down? Obviously you can use more or less green beans or bacon...but I find that the more the bacon the happier the green beans are and the better it tastes, duh, anything with bacon grease has to taste good. So go make this the side dish you bring to your Christmas dinner, really it's that good. People might turn up their noses at first, but once they take that first bite, they're a goner! YUM, I love bacon. 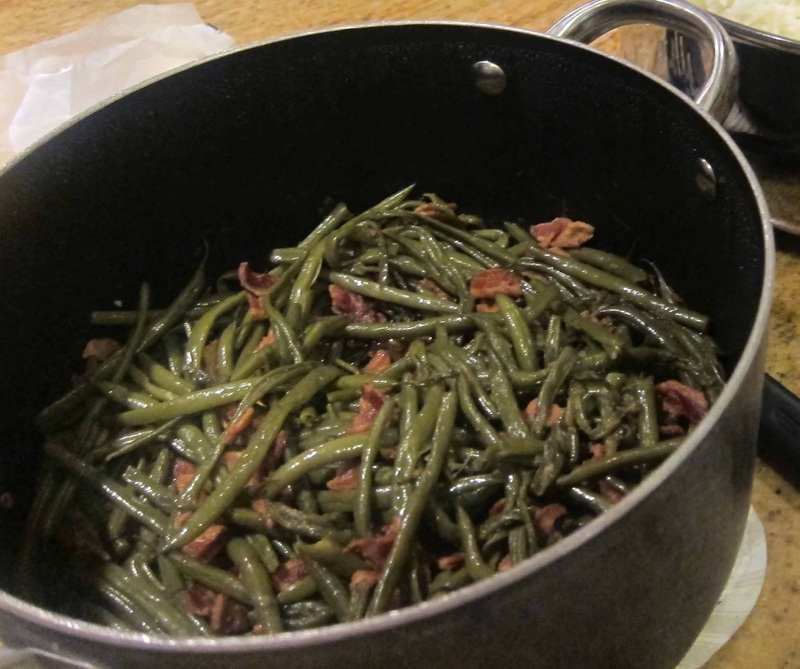 Green beans and bacon sounds awesome actually!